The price of copper ended 2017 near a four-year high of $3.30 a pound ($7,260 per tonne) extending the bull run in the red metal for a second year. 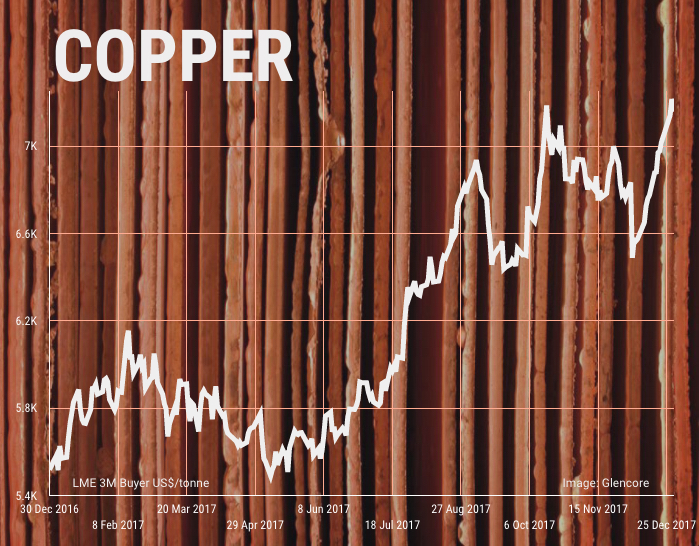 Measured from its multi-year lows struck at the beginning of 2016, copper has gained more than 70% in value. The run started on hopes (since dashed) of massive infrastructure investment in the US following the presidential election, but strikes in Q1, which at one point saw nearly a tenth of global production go offline, really set the tone for the year. By mid-year the rally was flagging, but talk of a Chinese ban on scrap imports saw the price take off again. The year-end surge may have been mostly due to dollar weakness but the buoyant mood evident throughout the year (not least among speculators on futures markets) was underpinned by prospects of a demand spike in coming years on the back of an electric vehicle boom. 2017 is likely to have been the first year in 12 to see a decline in global mine production, but growth should return this year as world number two producer Peru adds some 300,000 in new production, mines like Norilsk's Bystrinsky mine in Russia ramp up output, Glencore restarts its Zambian operations and greenfield commissioning such as First Quantum's Cobre Panama mine begins to factor into supply projections. “The markets where technology hasn’t substantially shortened the supply cycle, and where cost are rising, (i.e. copper) have the greatest long-term upside in prices"
But as happened last year labour action is likely to crimp any projected output growth. Wage negotiations could trigger disruptions at mines producing about 40% of global supply according to Barclays. INTL FCStone is penciling in a 1.26m tonne or 6% disruption allowance and most analysts see widening – if smallish – deficits. Copper from large scale expansions – Oyu Tolgoi and Grasberg going underground spring to mind – and greenfield projects like Udokan, Wafi-Golpu and Quellaveco – reach the market before new wave of demand from EVs does. Mid-year wage negotiations at Escondida – the globe’s only 1m tonne copper mine – crippled by a 44-day strike last year. Above $3.50 ($7,800 a tonne) by the end of 2018 and a rising trend into 2019. And that may be conservative.